"I know because I read. Your mind is not a cage. It's a garden. And it requires cultivating." Libba Bray. Hello everyone! With only two weeks left in the semester we thought we would share some reminders for you. Our regular hours will last through December 14th, the last day of classes. The following Monday, December 17th, the library will be open from 10:30 am until 4 pm. On Tuesday the 18th we will be open from 8 am until 12 noon for library services. The helpdesk staff will still be here to answer questions and give assistance. On Wednesday, the 19th, we will be open from 8-4. After that we will be closed for the holidays until January 2nd when we will be open from 8-4. Good luck to all of our students on their final exams, papers and projects! Have a safe and happy holiday and a wonderful new year! Our last Booked for Lunch for the semester will be tomorrow, November 20th at 12:30. We will be discussing memoirs, one of the most readable and unique genres in nonfiction. Hope to see you there! Next Monday, in honor of the 100th anniversary of the end of World War I, we will be screening All Quiet on the Western Front for our Movie Monday. We will have two showings: one at 11:30 am and one at 4:00 pm. All Quiet on the Western Front is an outstanding film. It won the Academy Award for Best Picture in 1930. 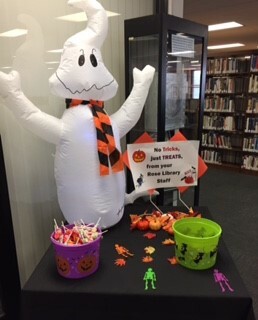 Our friendly inflatable ghost, pictured below, has buckets of treats to share! Stop by and visit us! Happy Halloween! Hocus Pocus for Movie Monday!!! Movie Monday is tonight at 5:30! We will be showing Hocus Pocus! Free admission and free popcorn! Hope to see you there! Booked for Lunch starts tomorrow! Join us from 12:30-1:30 on either Tuesday or Wednesday (we meet both days) to fill out an interest form and find out what Booked for Lunch is all about? Can't make it either day? No problem! Stop by the front desk and ask for a form and make a note of what days work best for you. (The time is not really changeable.) We will post all of the books we discuss here on this website after the second meeting each month. Hope to see you there! Our posting schedule is not yet set. By following in your email you will be sure to not miss a post. Enter your email in the box above.